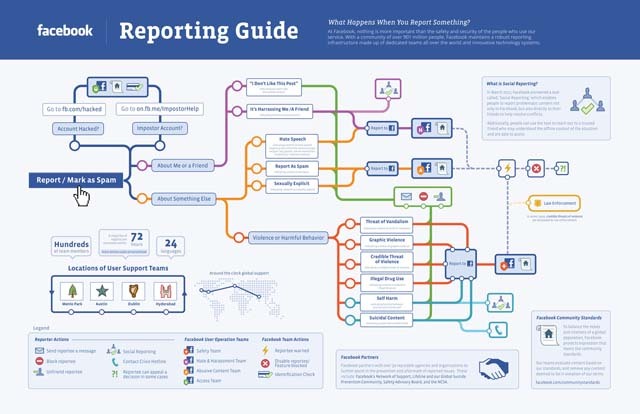 Facebook has provided users with tools to report spammy, mean or disgustingly naked content on Facebook for some time now, but today the team revealed the fancy (and rather colourful) process they go through to work out just how offensive the content you’ve flagged up REALLY is. It’s quite interesting to look at (even though we feel like we’re planning a really long trip on the tube) and teaches us not to report content for a joke, if you don’t like someone’s face or if you’re sick of seeing baby photos, because it could (but obviously won’t if the chart is followed correctly) lead to scary things, like law enforcement. OPINION: Will the Microsoft Surface tablet cause trouble for third-party hardware makers? if you don't like someone's face or if you're sick of seeing baby photos, because it could (but obviously won't if the chart is followed correctly) lead to scary things, like law enforcement.